Davy, Humphry (1800). Researches, Chemical and Philosophical. Bristol: Biggs and Cottle. ISBN 0407331506. (1813). Elements of Chemical Philosophy. London: Johnson and Co.. ISBN 0217889476. http://books.google.com/?id=0JcAAAAAMAAJ&pg=PA1&dq=humphry+davy. (1813). Elements Of Agricultural Chemistry In A Course Of Lectures. London: Longman. (1827). Discourses to the Royal Society. London: John Murray. (1828). Salmonia or Days of Fly Fishing. London: John Murray. http://books.google.com/?id=Qy8CAAAAYAAJ&pg=PA13&dq=humphry+davy. (1830). Consolations in Travel or The Last Days of a Philosopher. London: John Murray. http://books.google.com/?id=UnU0AAAAMAAJ&pg=PA1&dq=humphry+davy. ^ Berzelius, J. J.; trans. Jourdian and Esslinger (1829-1833) (French). Traite de chimie. 1 (trans., 8 vol. ed.). Paris. pp. 164. , (Swedish) Larbok i kemien (Original ed.). Stockholm. (1818). ^ a b c d Holmes, Richard (2008). The Age Of Wonder. Pantheon Books. ISBN 978-0-375-42222-5. ^ Cooper, Peter (December 23/30, 2000). “Humphry Davy — a Penzance prodigy”. The Pharmaceutical Journal 265 (7128): 920-921. オリジナルの2008年7月6日時点によるアーカイブ。. https://web.archive.org/web/20080706051401/http://www.pharmj.com/Editorial/20001223/articles/davy.html. ^ Enghag, P. (2004). “11. Sodium and Potassium”. Encyclopedia of the elements. Wiley-VCH Weinheim. ISBN 3527306668. ^ Davy, Humphry (1808). “On some new Phenomena of Chemical Changes produced by Electricity, particularly the Decomposition of the fixed Alkalies, and the Exhibition of the new Substances, which constitute their Bases”. Philosophical Transactions of the Royal Society of London (Royal Society of London.) 98: 1-45. doi:10.1098/rstl.1808.0001. http://books.google.com/?id=Kg9GAAAAMAAJ. ^ Weeks, Mary Elvira (1933). “XII. Other Elements Isolated with the Aid of Potassium and Sodium: Beryllium, Boron, Silicon and Aluminum”. The Discovery of the Elements. Easton, PA: Journal of Chemical Education. ISBN 0-7661-3872-0. ^ Robert E. Krebs (2006). The history and use of our earth's chemical elements: a reference guide. Greenwood Publishing Group. p. 80. ISBN 0313334382. http://books.google.com/?id=yb9xTj72vNAC. ^ Sir Humphry Davy (1811). “On a Combination of Oxymuriatic Gas and Oxygene Gas”. Philosophical Transactions of the Royal Society 101: 155–162. doi:10.1098/rstl.1811.0008. http://www.chemteam.info/Chem-History/Davy-Chlorine-1811.html. ^ Humphry Davy (1813). “On a New Detonating Compound”. Philosophical Transactions of the Royal Society of London 103: 1-7. doi:10.1098/rstl.1813.0002. http://links.jstor.org/sici?sici=0261-0523%281813%29103%3C1%3AOANDC%3E2.0.CO%3B2-2. ^ H. Davy (1813). “Sur la nouvelle substance découverte par M. Courtois, dans le sel de Vareck”. Annales de chemie 88: 322. ^ Humphry Davy (1814-01-01). “Some Experiments and Observations on a New Substance Which Becomes a Violet Coloured Gas by Heat”. Phil. Trans. R. Soc. Lond. 104: 74. doi:10.1098/rstl.1814.0007. http://rstl.royalsocietypublishing.org/content/104/74.full.pdf+html. ^ Williams, L. Pearce (1965). 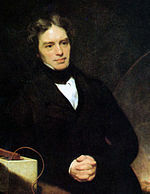 Michael Faraday: A Biography. New York: Basic Books. pp. 36. ISBN 0306802996. ^ Paris, John Ayrton (1831). The Life of Sir Humphry Davy, Bart., LL.D.. London: Henry Colburn and Richard Bentley. pp. 516-517. http://books.google.com/?id=e5oEAAAAYAAJ&pg=PA516&dq=Plainpalais+Cemetery. Davy, John (1839-1840). The Collected Works of Sir Humphry Davy. London: Smith, Elder, and Company. ISBN 0217889441. Hartley, Harold (1960). “The Wilkins Lecture. Sir Humphry Davy, Bt., P.R.S. 1778-1829”. Proceedings of the Royal Society of London. Series A, Mathematical and Physical Sciences 255 (1281): 153-180. doi:10.1098/rspa.1960.0060. http://links.jstor.org/sici?sici=0080-4630%2819600405%29255%3A1281%3C153%3ATWLSHD%3E2.0.CO%3B2-E.
Treneer, Anne (1963). The Mercurial Chemist, A Life of Sir Humphry Davy. London: Methuen. Hartley, Harold (1966). Humphry Davy. London: Nelson. ISBN 0854097295. Knight, David (1992). Humphry Davy: Science and Power. Cambridge, UK: Cambridge University Press. ISBN 0631168168. Lamont-Brown, Raymond (2004). 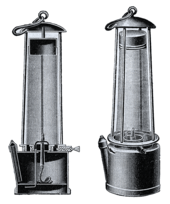 Humphry Davy, Life Beyond the Lamp. Stroud: Sutton Publishing. ISBN 0750932317. Kenyon, T. K. (2008/2009). “Science and Celebrity: Humphry Davy’s Rising Star”. Chemical Heritage 26: 30-35. http://www.chemheritage.org/pubs/ch-v26n4-articles/feature_davy_p1.html.